1. 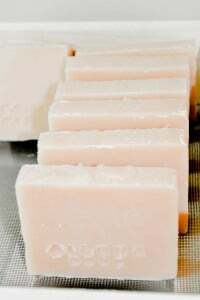 When storing your soap, take off the wrapper and expose the soap to air. This will help harden the bar. The harder the bar, the longer the soap will last. 2. When your soap is in the shower, store it out of the water. Use a soap dish with slats for the water to drain. And make sure the soap dish is not in the path of the shower spray. 3. When you wash with soap, use a washcloth (loofah, soap net, sponge). Soap up the washcloth, put the soap down in the soap dish and wash. You will get clean without rubbing the soap directly on your body, and you will save soap. If you have any tips on how you keep your handcrafted soap lasting longer, I’d love to hear about it in the comments below.